The Platform on Disaster Displacement and Refugees International. Every year, millions of people are forced to leave their homes due to floods, tropical storms, droughts, earthquakes, and other natural hazards. Climate change is not only exacerbating weather-related hazards but also contributing to glacial melt and sea level rise, forcing affected communities to retreat inland. 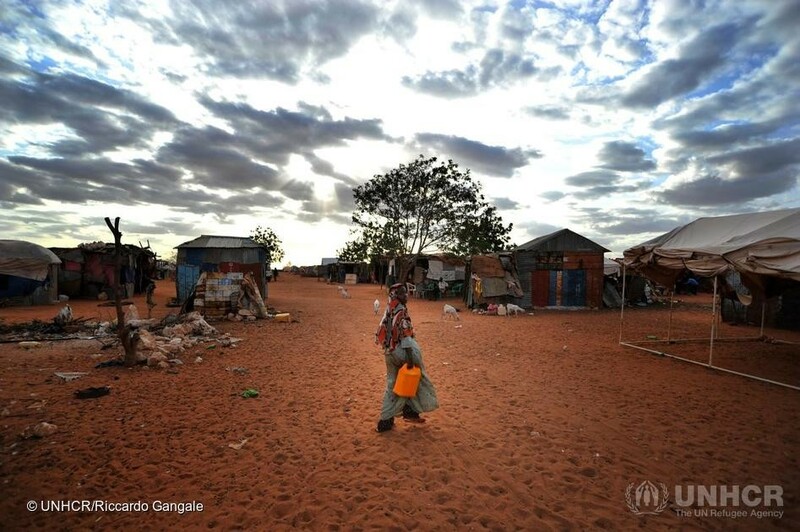 The good news is that important international efforts and initiatives to address the challenge of displacement and migration in the context of disasters, environmental degradation, and the adverse effects of climate change are beginning to bear fruit. At the end of 2018, two important events will take place. United Nations Member States have now finalized the final draft text of a Global Compact for Safe, Orderly and Regular Migration (GCM), which will be presented to States for adoption at an Intergovernmental Conference in Marrakesh, Morocco in December 2018. The compact seeks to address all-important dimensions of migration and, for the first time in an internationally-negotiated document, includes specific commitments to address disaster and climate change as drivers of migration and to protect those who are compelled to leave their countries because of such factors. Committee of the Warsaw International Mechanism for Loss and Damage on behalf of its Task Force on Displacement (TFD) in September 2018. These two global policy events are the culmination of extensive consultation and negotiation over the past several years among States, international organizations, civil society representatives, academic and research institutions, as well as affected populations, migrants, and displaced persons. They represent broad international recognition of the increasing impacts of disasters and climate change on displacement and migration, and consensus on the need for international cooperation to address the growing risk that climate change presents to the human rights of people in vulnerable situations around the globe. If fully implemented, the GCM and the TFD recommendations – together with other global development instruments such as the 2030 Agenda for Sustainable Development, the Sendai Framework for Disaster Risk Reduction, and the UNFCCC Paris Agreement represent historic opportunities to reduce disaster- and climate-related displacement risk, to better protect those who are uprooted in this context, and to support safe, orderly and regular migration as an adaptation strategy. 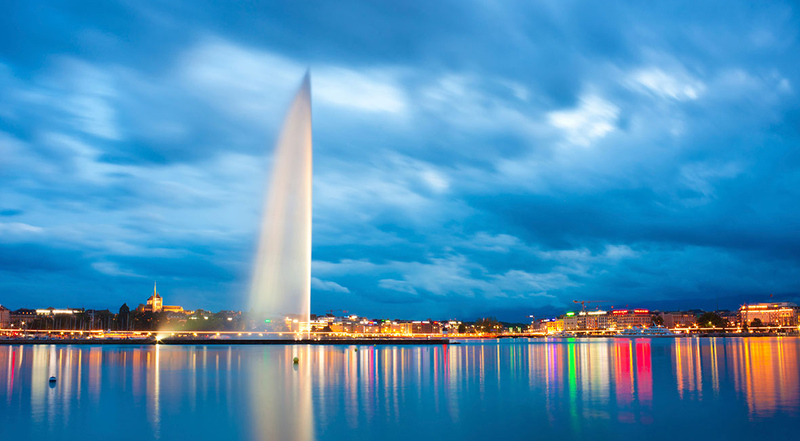 For these two significant policy breakthroughs to work most effectively, however, the GCM and the TFD recommendations will need to be mutually supportive and complement one another. How can we promote complementarity between the GCM and the TFD recommendations? How can stakeholders ensure that there is strong support for implementation of the commitments and recommendations? What forms of monitoring, follow-up, and accountability mechanisms will be necessary to ensure that the GCM and TFD recommendations have an impact? What resources are available for implementation, in particular, for countries and communities most vulnerable to climate change, including small island developing States and least developed countries? Ultimately, how can we make sure that the link between climate change and human mobility remains on top of the international policy agenda? Join us in this Webinar to discuss challenges and strategies to address them as we move towards the adoption of the GCM and the consideration of the TFD recommendations at COP24. 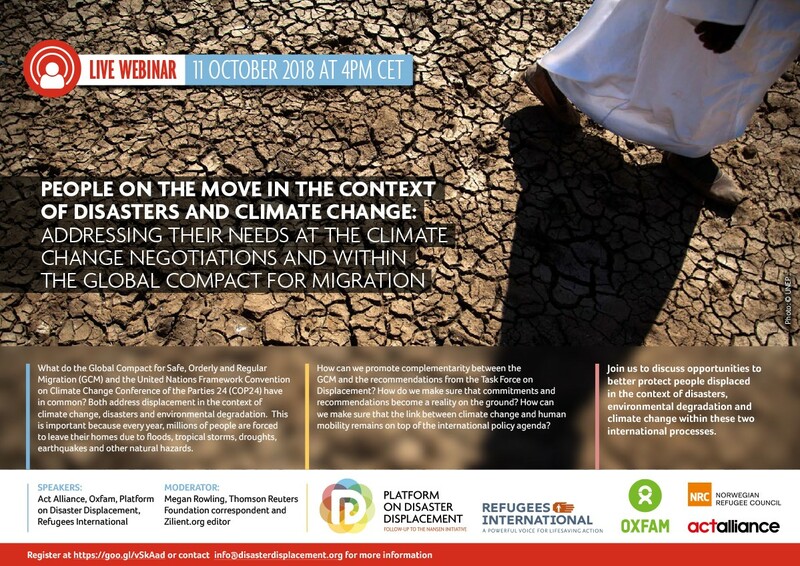 This webinar will consist of a panel of speakers from Refugees International, the United Nations Framework Convention on Climate Change, Oxfam International, Act Alliance, the Norwegian Refugee Council and the Platform on Disaster Displacement and moderated by Ms. Megan Rowling, Resilience Editor, Thomson Reuters Foundation. Please, register here, and submit any essential questions that you may have in order to help guide the conversation.